A strange and slightly disorienting experience to revisit now that we are ‘ex ex-pats in Zurich. No longer a place to call home but still with friends there to make a visit worthwhile. Funny day; a stop off at our old local supermarket to buy our favourite wine (Spanish but we simply have not been able to find elsewhere other than this little Greek Spar round the corner from Hottingerplatz), to the post office to change a pile of Swiss Franc small change to notes (a very stressful experience – you should try making a roll of 25 x 1 franc pieces with a little piece of paper!) and to the ‘Apple’ shop for a new laptop. 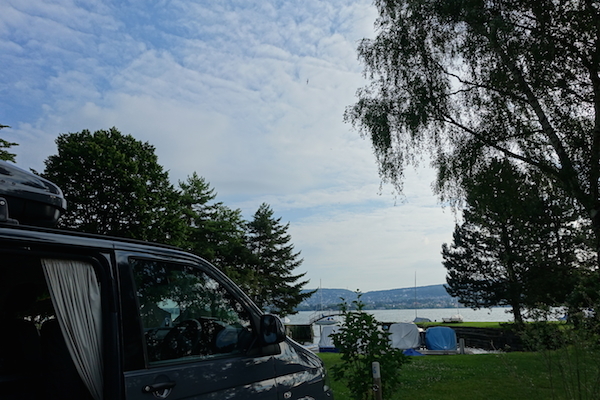 Then off to Fischers Fritz camp site on the side of Zurich See (a new find for us as tourists rather than ex-pats here); a little spot with a lake view, not a bad substitute for the view we used to have from the apartment on the other side of the lake. From our quiet space we could see the Dolder (the hotel closest to FIFA headquarters where many footballers stay) just up the hill from our old apartment. The campsite shop had a great array of local Swiss cheeses and wonderful fresh bread so we splashed out on local produce with some Berg kase (specific cheese with milk from cows who live at altitude in the alps) and some typical Swiss bread (long flat loaf, light and fluffy on the inside and toasted and crunchy on the outside). 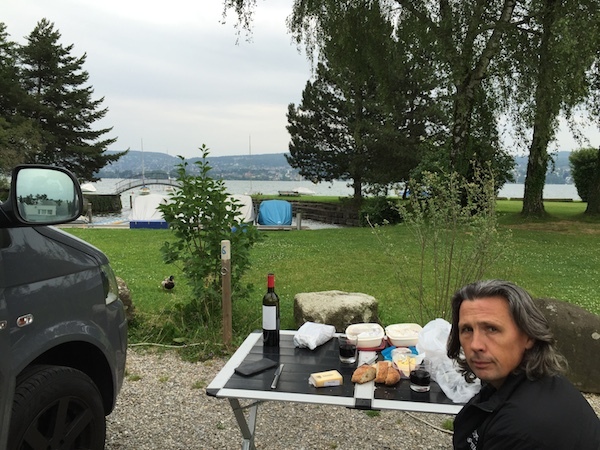 We enjoyed a rather rapid late lunch by the van watching the boats sail by on the lake and then hopped on the bus towards Hardbrucke to meet our friends. Hardbrucke is an intriguing mix of industry and residential with some really great, alternative places to eat and drink that particularly in the summer, seem to spring up from nowhere. 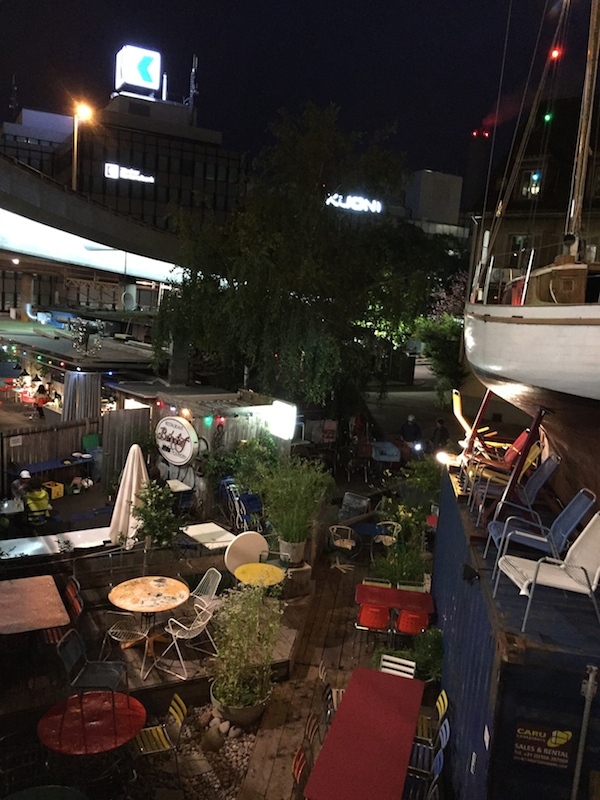 We met at Frau Gerold’s Garten, originally a make shift bar and place to eat in the summer, now almost a mini village with an outdoor bar, a few craft and clothes shops and the main ‘Freitag’ bag shop all housed in old cargo containers. It’s off the beaten track and not so easy to find so I would definitely recommend anyone visiting Zurich to make the effort to go there. It’s very much a local’s place (a little like Spitalfields in London) and locals being a mix of ex-pats as well as true Zurich locals. A great night, like many nights we’ve had in Zurich, relaxed and effortless socialising with friends, an interesting mix of people, all like-minded with a similar sense of adventure and a focus on getting the most out of life. We said our goodbyes promising it was not really goodbye. We then headed off on a combination of tram and bus, getting off the bus early for what was probably our last walk along the side of the lake a familiar and beautiful place and we found just as enjoyable being tourists as ex-pats in Zurich.